Laura has provided a short bio as well. "I was born and raised in Klaipeda, Lithuania. Moved to the US together with my family when I was 18 years old. My parents and two younger brothers settled in Philadelphia and I decided to move to New York City for college. I received my BFA in Fashion Design from Parsons School of Design in 2007 and have been working in sweater design in fashion industry since then. Luxe Knits was a project I got involved into my last semester at Parsons and it finally came to life last August. 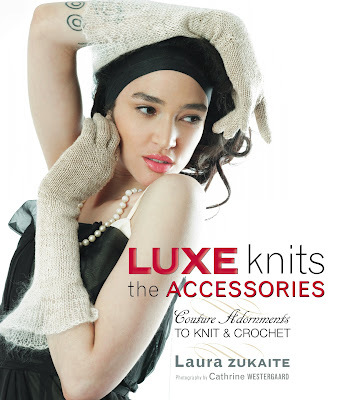 This upcoming Fall everyone should expect a nice surprise- Luxe Knits: The Accessories- a book that will continue the aesthetics of the Luxe Knits in every sense of it." I take inspiration from the beautiful things I see around me… It could be something like crack on the sidewalk or a modern piece of furniture. Today I was passing a street full of blooming trees and the petals were falling down like snow… It was very inspirational. The design itself usually determines it for me. There have been cases where I could only have the Small and the Large. But most of the time I try to cover a variety of sizes if it is possible. Working in Fashion Industry- looking at other designers’ work is by now a part of my daily routine. It is a part of the research we do. To know is to have the power. And to know what other designers are doing gives you the perspective where the trends are headed. There are very few things to be left invented in fashion- what makes a designer unique is his own personal vision. 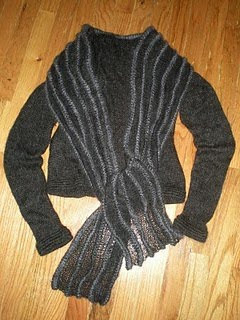 I do most of the knitting myself. There were a few projects in Luxe Knits and the new upcoming book Luxe Knits: The Accessories where I had to get some help because of the deadlines. I keep it all in the family though- and my mother, who is an excellent knitter, has completed a few of my designs for both books. The Internet has a huge impact on my everyday life as well as my work. Starting with the basic communication- which is mostly done through email…and ending with research and letting people know about you and your work. Internet is a powerful tool. I live an extremely active lifestyle. I do cycling, running (recently completed my first Half Marathon), skiing, swimming… That helps me to relax my mind so that when I get back to work- I am really focused and dedicated. I welcome criticism! I believe that the only way you can improve what you are doing is by taking the criticism from others. It is not just a career. It is a lifestyle. You have to love it so much that you would crave knitting…If that sounds like you- then go for it! Laura's upcoming book is pictured below.